SIBA stands for the German expression for fuse factory. That means that we develop and produce fuses. 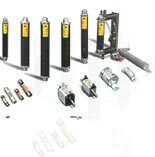 They protect machines, electrical components and installations against critical currents. But what is more important is that they save people´s lives. SIBA is a traditional family business and known worldwide as the market leader for high- voltage fuses. For more than 50 years SIBA has developed from a small business to a global company. As a matter of course we have worldwide recognized certificates such as ISO 9000, ISO 14000 and more. Our products fulfill besides the requirements of the international standards of IEC a lot of country specific standards.